Ruth Wilgress, a Toronto artist and expressive arts therapist has now officially taken over the reins of the Daily Distillery blog reporting on life inside this historic complex. She’s busy doing updates, profiling the artists and their exhibitions, restaurants and theatres, coffee shops and bakeries, furniture stores and gift shops that make the district so uniquely special. 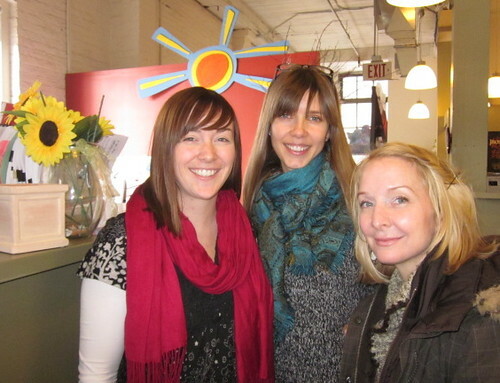 Here she is hanging out with Amber and Anna from Tapestry, a not for profit Canadian opera development company that’s just absolutely cool! Ruth writes about these people because she believes that anywhere artists can find support and get the proper resources to be creative in their disciplines must be celebrated, and promoted online. These types of organizations, and the tireless passion of these people really helps make our culture more profound; as Canadian citizens their local works of music and dance makes us all richer – especially when they tell our stories. You can read Ruth’s article on Amber and Jenn from Tapesty on Daily Distillery, and maybe attend an upcoming event. Ruth encourages her readers to show your support by buying tickets. After almost three months without any updates, Canada Blog friends sprang to life again this week with an update on another great Canadian blogger. Jacques Surveyer from Cobourg Ontario is profiled on Canada Blog Friends and forever documented as a web business blogger and consultant with a penchant for photography. Jacques is quite skilled in the art of using photo finishing software to manufacture amazing images. I was particularly moved by the story about – some thing that wasn’t mentioned in the article was that Jacques is giving free blog workshops in Cobourg to help spread the knowledge of what’s possible these days to help people in the rural community. This entry was posted in Canada, Canadian History, culture, Ontario, Toronto and tagged blogger, Canada Blog Friends, Expressive arts therapy, Jacques Surveyer, new Canadian operas, Ruth Wilgress, Tapestry. Bookmark the permalink.